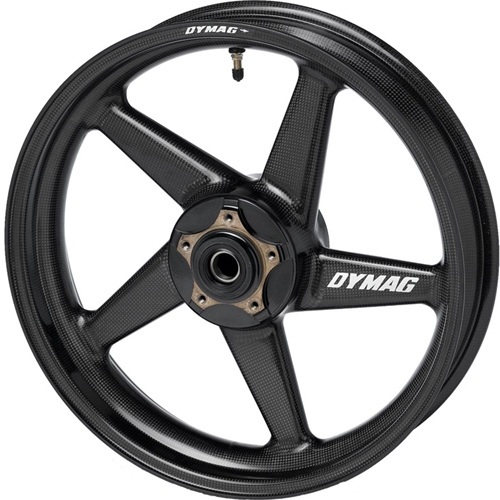 Dymag is an elite, British performance wheel brand with an unparalleled history of innovation and technology in motorsport. 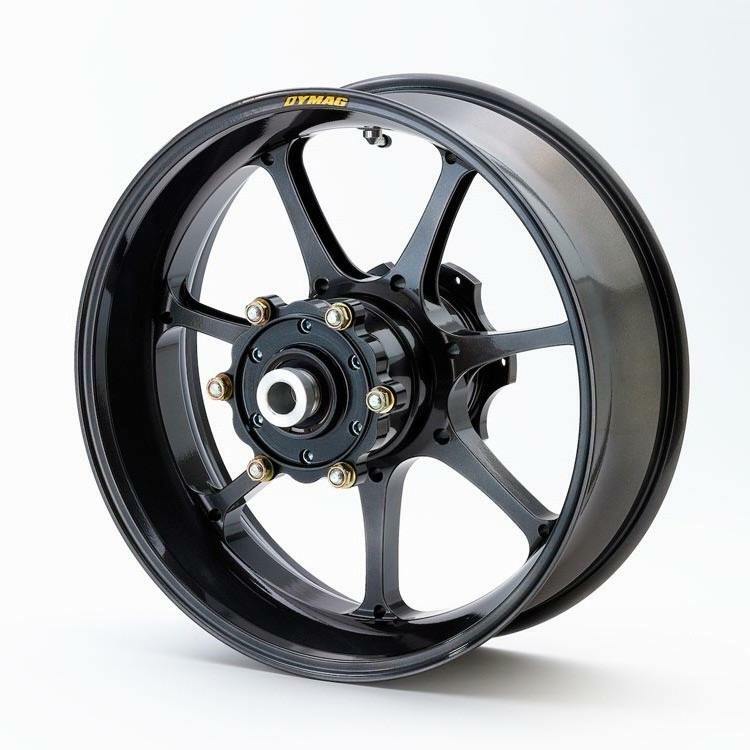 From F1, Indy Car, and World Endurance to all levels of motorcycle sports -- including the toughest test of all -- the Isle of Man TT -- Dymag has led the way in wheel design and production for more than four decades. 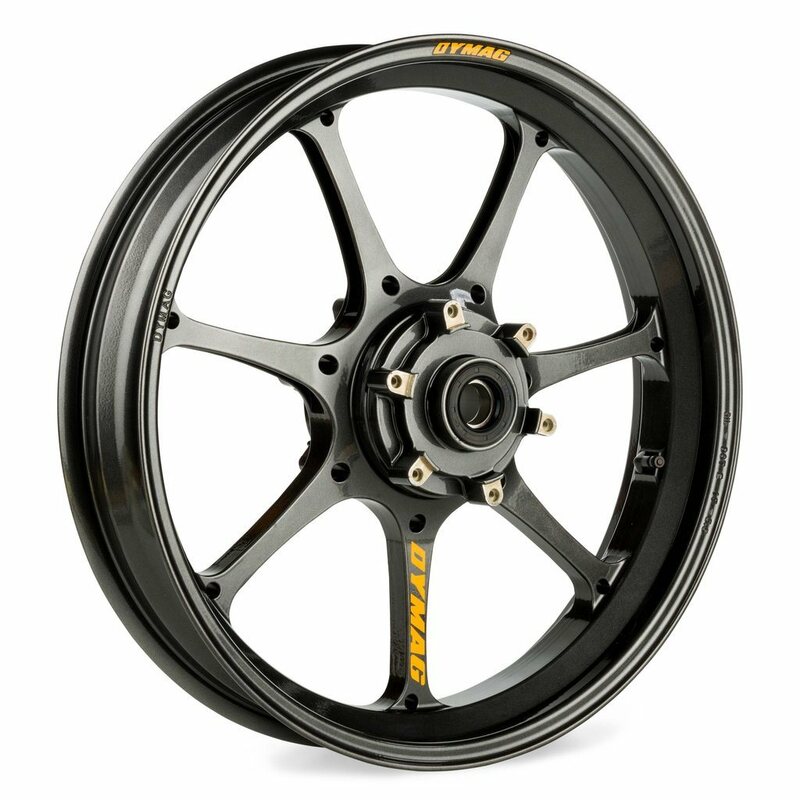 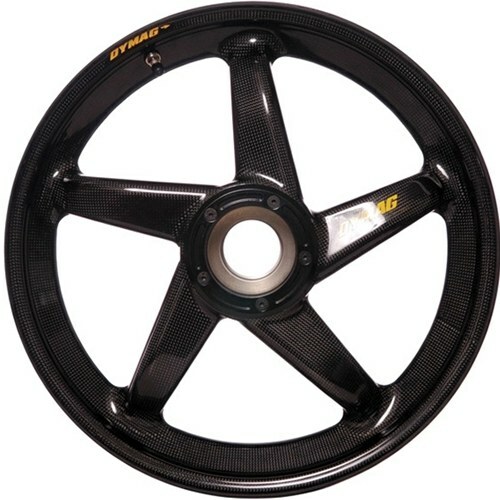 Racers like Ayrton Senna, Nigel Mansell, Eddie Lawson and Barry Sheene all won championships on Dymag Wheels! Did you know Dymag was the first company in the world to manufacture carbon composite wheels for both high performance cars and motorcycles certified for road as well as racing use? 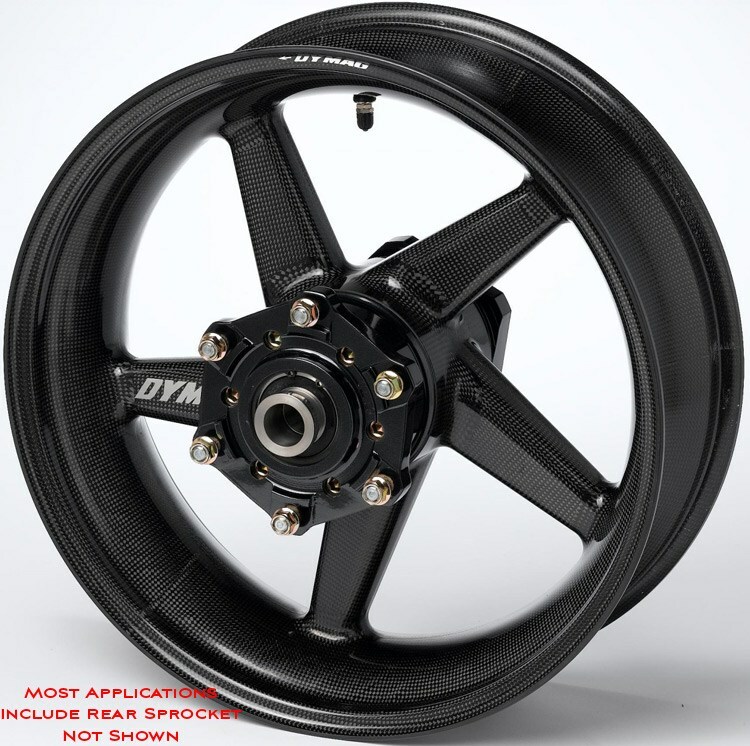 We’re currently offering Carbon CA5 and Aluminum UP7X versions in wide range of available fitments ranging from as far back as the 1970s. 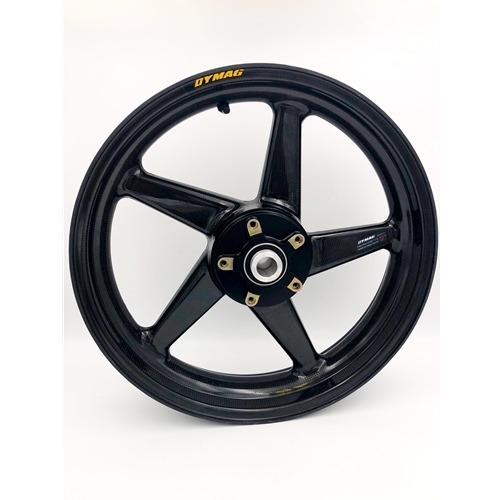 Dymag Aluminum Wheel UP7X - #UP7X-3129A XV950 15-16 Front 17" x 3.5"
Dymag Aluminum Wheel UP7X - #UP7X-B1224A KZ1000 / KZ1000 mk2 76- 81 , Z1R 78-80 Front 17" x 3.5"
Dymag Aluminum Wheel UP7X - #UP7X-B1226A KZ1000 / KZ1000 MK2 76-81 , Z1R 78-80 Rear 17"
Dymag Aluminum Wheel UP7X - #UP7X-B1227A GS1000 78-84, GS1100 80-83 Front 17"x3.5"
Dymag Aluminum Wheel UP7X - #UP7X-B1228A GS1100 80-83, GS1150 84-86 Rear 17"
Dymag Aluminum Wheel UP7X - #UP7X-B1228A GS1100 80-83, GS1150 84-86 Rear 17" 17"
Dymag Aluminum Wheel UP7X - #UP7X-B1231A CB750F 79-83, CB900F 79-83, CBX1000 79-83 Front 17" x 3.5"
Dymag Aluminum Wheel UP7X - #UP7X-B1233A GSXR1100 88-96 ,GSF1200 Bandit 96- 00 Front 17"x3.5"
Dymag Aluminum Wheel UP7X - #UP7X-B1234A GSXR1100 (15mm Spindle)86 -87 Rear 17"
Dymag Aluminum Wheel UP7X - #UP7X-B1237A CBR900R 95- 97 Front 17" x 3.5"
Dymag Aluminum Wheel UP7X - #UP7X-B1248A KZ1000 J/R 81- 84 Front 17" x 3.5"
Dymag Aluminum Wheel UP7X - #UP7X-B1274A GSXR1100 (15mm Spindle)86 Front 17"x3.5"
Dymag Aluminum Wheel UP7X - #UP7X-B1294A ZRX1100 97-00 , ZRX1200 01-08 Front 17" x 3.5"
Dymag Aluminum Wheel UP7X - #UP7X-B1339A CB1100F 83 Rear 17"
Dymag Aluminum Wheel UP7X - #UP7X-B1339B CB750F,CB900F 79-84, CBX1000 78-83 Rear 17"
Dymag Aluminum Wheel UP7X - #UP7X-B1354B CB1100F 83 Front 17" x 3.5"
Dymag Aluminum Wheel UP7X - #UP7X-B1495A V-Max 1200 Front 17" x 3.5"
Dymag Aluminum Wheel UP7X - #UP7X-B1496A V-Max 1200 Rear 17"
Dymag Aluminum Wheel UP7X - #UP7X-B1497A FJ1100 84- 85, FJ1200 86-98 Front 17" x 3.5"
Dymag Aluminum Wheel UP7X - #UP7X-B1524A CBR900R 92- 94 Front 17" x 3.5"
Dymag Aluminum Wheel UP7X - #UP7X-B1609A GSXR1100 93-96 Rear 17"
Dymag Aluminum Wheel UP7X - #UP7X-B1639A GSXR600 00-05,GSXR750 00-04, TL1000 98-01 Rear 17"
Dymag Aluminum Wheel UP7X - #UP7X-B1639B GSXR1300 Hayabusa 99 - 07 Rear 17"
Dymag Aluminum Wheel UP7X - #UP7X-B1640A TL1000R 98- 00 , TL1000S 97-00 ,GSXR1300 Hayabusa 99-07 Front 17"x3.5"
Dymag Aluminum Wheel UP7X - #UP7X-B1640A TL1000R 98- 00 , TL1000S 97-00 ,GSXR1300 Hayabusa 99-07 Front 17" x 3.5"
Dymag Aluminum Wheel UP7X - #UP7X-B1640A TL1000R 98- 00 , TL1000S 97-00 ,GSXR1300R 99-07 Front 17"x3.5"
Dymag Aluminum Wheel UP7X - #UP7X-B1667A FJ1100 84- 85 Rear 17"
Dymag Aluminum Wheel UP7X - #UP7X-B1770B Speed Triple 1050 08-10 Rear 17"
Dymag Aluminum Wheel UP7X - #UP7X-B1795A ZRX1100 97-00 Rear 17"
Dymag Aluminum Wheel UP7X - #UP7X-B1835A CBR1100XX Blackbird 97-00 Rear 17"
Dymag Aluminum Wheel UP7X - #UP7X-B1838A CBR900R 95-99 Rear 17"
Dymag Aluminum Wheel UP7X - #UP7X-B1882A CBR900RR 98- 99 Front 17" x 3.5"
Dymag Aluminum Wheel UP7X - #UP7X-B1883A YZFR1 98- 03 Front 17" x 3.5"
Dymag Aluminum Wheel UP7X - #UP7X-B1883B XJR1300 15-Front 17" x 3.5"
Dymag Aluminum Wheel UP7X - #UP7X-B1884A YZF-R1 98-01 Rear 17"
Dymag Aluminum Wheel UP7X - #UP7X-B1884B YZF-R1 02-03 Rear 17"
Dymag Aluminum Wheel UP7X - #UP7X-B2035A CBR1100XX Blackbird 99- 00 Front 17" x 3.5"
Dymag Aluminum Wheel UP7X - #UP7X-B2035C VFR800 VTEC 10 Front 17" x 3.5"
Dymag Aluminum Wheel UP7X - #UP7X-B2098A SV650 99- 02 Front 17"x3.5"
Dymag Aluminum Wheel UP7X - #UP7X-B2099A SV650 99-02 Rear 17"
Dymag Aluminum Wheel UP7X - #UP7X-B2099B SV650 03-04 Rear 17"
Dymag Aluminum Wheel UP7X - #UP7X-B2099C SV650i (Injection Model) 05-10 Rear 17"
Dymag Aluminum Wheel UP7X - #UP7X-B2145B F3+ Brutale 675-800 12-14 ,F4 up to 13, Brutale 05-14 Rear 17"
Dymag Aluminum Wheel UP7X - #UP7X-B2167A RC51 00-02 Front 17" x 3.5"
Dymag Aluminum Wheel UP7X - #UP7X-B2167C CBR600RR 03- 06, Front 17" x 3.5"
Dymag Aluminum Wheel UP7X - #UP7X-B2168A RC51 00-02 Rear 17"
Dymag Aluminum Wheel UP7X - #UP7X-B2168B CBR929 , CBR954 00-03 Rear 17"
Dymag Aluminum Wheel UP7X - #UP7X-B2168D CBR1000RR 04-09 Rear 17"
Dymag Aluminum Wheel UP7X - #UP7X-B2193A CBR929RR 01-01 , CBR954RR 02-03 Front 17" x 3.5"
Dymag Aluminum Wheel UP7X - #UP7X-B2193B CBR1000RR 04- 07 Front 17" x 3.5"
Dymag Aluminum Wheel UP7X - #UP7X-B2203A GSXR1100 88-92 Rear 17"
Dymag Aluminum Wheel UP7X - #UP7X-B2217A ZX12R 00-05 Rear 17"
Dymag Aluminum Wheel UP7X - #UP7X-B2218A ZX-12R 00- 05 Front 17" x 3.5"
Dymag Aluminum Wheel UP7X - #UP7X-B2248A GSXR600 00-05, GSXR750 00-05, GSXR1000 01- 04 , SV1000 03- 04 Front 17" x 3.5"
Dymag Aluminum Wheel UP7X - #UP7X-B2257A GSXR750 05, GSXR1000 01-08 Rear 17"
Dymag Aluminum Wheel UP7X - #UP7X-B2321B XJR1300 15- Rear 17"
Dymag Aluminum Wheel UP7X - #UP7X-B2331A ZRX1200 01-08 Rear 17"
Dymag Aluminum Wheel UP7X - #UP7X-B2366A 1098 07- 09, 1198 09, Monster 1200 14-16, 1200 MultiStrada 10, 848 08-13, Hypermotard 1100S 08, Monster M1100 09, Streetfighter 09 Front 17"x3.5"
Dymag Aluminum Wheel UP7X - #UP7X-B2414B GSXR1100 (17mm Spindle)87 Front 17"x3.5"
Dymag Aluminum Wheel UP7X - #UP7X-B2496A CBR600 RR 03-04 Rear 17"
Dymag Aluminum Wheel UP7X - #UP7X-B2496B CBR600 RR WITH OR WITHOUT ABS 05-16 Rear 17"
Dymag Aluminum Wheel UP7X - #UP7X-B2524A ZX600 (ZX-6R)04 Front 17" x 3.5"
Dymag Aluminum Wheel UP7X - #UP7X-B2548A XLH1200 Sportster / Hugger (Belt Drive) 00-02,XL1200S Sportster 03 Rear 17"
Dymag Aluminum Wheel UP7X - #UP7X-B2549A ER6F + Versys-06 , ZX10R (20mm Spindle) 04- 05 Front 17" x 3.5"
Dymag Aluminum Wheel UP7X - #UP7X-B2550A ZX10R 04-10 Rear 17"
Dymag Aluminum Wheel UP7X - #UP7X-B2558A YZFR1 04- 14 , YZFR6 03-16 Front 17" x 3.5"
Dymag Aluminum Wheel UP7X - #UP7X-B2576A YZFR6 03-05, YZFR6S 05-07 , YZFR6 06-16 Rear 17"
Dymag Aluminum Wheel UP7X - #UP7X-B2599A V ROD 02- 07 Front 17"x3.5"
Dymag Aluminum Wheel UP7X - #UP7X-B2600A V ROD 02-07 Rear 17"
Dymag Aluminum Wheel UP7X - #UP7X-B2605A RC8 06-16 Front 17"x3.5"
Dymag Aluminum Wheel UP7X - #UP7X-B2634A GSXR600 06-07, GSXR750 06-07 , GSXR1000 05- 08 Front 17" x 3.5"
Dymag Aluminum Wheel UP7X - #UP7X-B2643A SV650 03- 10 Front 17" x 3.5"
Dymag Aluminum Wheel UP7X - #UP7X-B2647A RSV4 1000 and RSV Tuono and APRC-09-16 Front 17" x 3.5"
Dymag Aluminum Wheel UP7X - #UP7X-B2679A ZX10R 06-15, ZX6R 05- 17 Front 17" x 3.5"
Dymag Aluminum Wheel UP7X - #UP7X-B2701A ZX6R + 636 05-17 Rear 17"
Dymag Aluminum Wheel UP7X - #UP7X-B2706A 675 Daytona 06- 14 Front 17" x 3.5"
Dymag Aluminum Wheel UP7X - #UP7X-B2706A 675 Street Triple 06- 14 Front 17" x 3.5"
Dymag Aluminum Wheel UP7X - #UP7X-B2714A GSXR600 06-10, GSXR750 06-10 Rear 17"
Dymag Aluminum Wheel UP7X - #UP7X-B2714B GSXR600 11-18, GSXR750 08-18 Rear 17"
Dymag Aluminum Wheel UP7X - #UP7X-B2721A 675 Daytona 06-14 Rear 17"
Dymag Aluminum Wheel UP7X - #UP7X-B2721A 675 Street Triple 06-14 Rear 17"
Dymag Aluminum Wheel UP7X - #UP7X-B2730A ZX14 06- 17 Front 17" x 3.5"
Dymag Aluminum Wheel UP7X - #UP7X-B2731A ZX14 06-18 Rear 17"
Dymag Aluminum Wheel UP7X - #UP7X-B2731A ZX14 06-17 Rear 17"
Dymag Aluminum Wheel UP7X - #UP7X-B2735A RC8 ( CUSH DRIVE) 06-16 Rear 17"
Dymag Aluminum Wheel UP7X - #UP7X-B2743A Speed Triple 1050 05- 07, 1050 Tiger 07- 10 Front 17" x 3.5"
Dymag Aluminum Wheel UP7X - #UP7X-B2772A FZ1000 Fazer - 06- Rear 17"
Dymag Aluminum Wheel UP7X - #UP7X-B2781A CBR600RR 07- 09 Front 17" x 3.5"
Dymag Aluminum Wheel UP7X - #UP7X-B2785A GSXR1300 Hayabusa 08-18 , 1340 B-KING 08- 11 Front 17"x3.5"
Dymag Aluminum Wheel UP7X - #UP7X-B2785A GSXR1300 Hayabusa 08-17 , 1340 B-KING 08- 11 Front 17"x3.5"
Dymag Aluminum Wheel UP7X - #UP7X-B2786A GSXR1300 Hayabusa 08-16 non ABS Rear 17"
Dymag Aluminum Wheel UP7X - #UP7X-B2803A CBR1000RR 08- 16 Front 17" x 3.5"
Dymag Aluminum Wheel UP7X - #UP7X-B2858A GSXR600 , GSXR750 08- 10, GSXR1000 09-18 Front 17" x 3.5"
Dymag Aluminum Wheel UP7X - #UP7X-B2858A GSXR600/GSXR750 08-10/GSXR1000 09-18 Front 17" x 3.5"
Dymag Aluminum Wheel UP7X - #UP7X-B2859A GSXR1000 NON ABS 09-16 Rear 17"
Dymag Aluminum Wheel UP7X - #UP7X-B2860A S1000RR 09-17, S1000RR ABS 15-17 Front 17" x 3.5"
Dymag Aluminum Wheel UP7X - #UP7X-B2861A S1000RR 09-17, HP4 13-15, S1000RR (ABS)15-17 Rear 17"
Dymag Aluminum Wheel UP7X - #UP7X-B2880A ZX10R 11-17 Rear 17"
Dymag Aluminum Wheel UP7X - #UP7X-B2884A CBR1000RR ABS 09-18 Rear 17"
Dymag Aluminum Wheel UP7X - #UP7X-B2908A Z1000 07- 09 Front 17" x 3.5"
Dymag Aluminum Wheel UP7X - #UP7X-B2909A Z1000 07-09 Rear 17"
Dymag Aluminum Wheel UP7X - #UP7X-B3042A GSXR600 , GSXR750 11-18 Front 17" x 3.5"
Dymag Aluminum Wheel UP7X - #UP7X-B2917 A 1340 B-KING 08-11 Rear 17"
Dymag Aluminum Wheel UP7X - #UP7X-B2934A Panigale 899/959 14-17 Front 17" x 3.5"
Dymag Aluminum Wheel UP7X - #UP7X-B2944A Speed Triple 1050 08- 10 Front 17" x 3.5"
Dymag Aluminum Wheel UP7X - #UP7X-B2945A Speed Triple 1050 11-15 Front 17" x 3.5"
Dymag Aluminum Wheel UP7X - #UP7X-B2946A Speed Triple 1050 11-15 Rear 17"
Dymag Aluminum Wheel UP7X - #UP7X-B2950A XR1200 10-12 Front 17"x3.5"
Dymag Aluminum Wheel UP7X - #UP7X-B2951A XR1200 Rear 17"
Dymag Aluminum Wheel UP7X - #UP7X-B2954A RSV4 1000 and Tuono and APRC 09-16 Rear 17"
Dymag Aluminum Wheel UP7X - #UP7X-B2956A F3 + Brutale -12 Front 17"x3.5"
Dymag Aluminum Wheel UP7X - #UP7X-B2957A F4 + Brutale 10- 13 Front 17"x3.5"
Dymag Aluminum Wheel UP7X - #UP7X-B2958A Z1000SX 11-12, Z800 13-16 Front 17" x 3.5"
Dymag Aluminum Wheel UP7X - #UP7X-B2959A Z1000 10-14 , Z1000SX AND ABS 11-14 Rear 17"
Dymag Aluminum Wheel UP7X - #UP7X-B2971A VFR1200 10-17 Rear 17"
Dymag Aluminum Wheel UP7X - #UP7X-B2972A S1000RR HP4 13-15 Front 17"x3.5"
Dymag Aluminum Wheel UP7X - #UP7X-B2988A YZF-R1 04-14 Rear 17"
Dymag Aluminum Wheel UP7X - #UP7X-B2995A FZ1000 Fazer ABS 06- Rear 17"
Dymag Aluminum Wheel UP7X - #UP7X-B3044A 899/959 Panigale 14-17 Rear 17"
Dymag Aluminum Wheel UP7X - #UP7X-B3075A Z800 13-16 Rear 17"
Dymag Aluminum Wheel UP7X - #UP7X-B3084B YZFR1 15-19 Front 17" x 3.5"
Dymag Aluminum Wheel UP7X - #UP7X-B3085A YZF-R1 15-18 Rear 17"
Dymag Aluminum Wheel UP7X - #UP7X-B3093A GSX1300R W/ABS 13-18 Front 17" x 3.5"
Dymag Aluminum Wheel UP7X - #UP7X-B3094A GSXR1300 Hayabusa + ABS 13-18 Rear 17"
Dymag Aluminum Wheel UP7X - #UP7X-B3112A S1000XR 15-17 Front 17" x 3.5"
Dymag Aluminum Wheel UP7X - #UP7X-B3113A S1000XR 15-17 Rear 17"
Dymag Aluminum Wheel UP7X - #UP7X-B3116A 675 Daytona 15-16 Front 17" x 3.5"
Dymag Aluminum Wheel UP7X - #UP7X-B3117A 675 Daytona 15-16 Rear 17"
Dymag Aluminum Wheel UP7X - #UP7X-B3130A XV950 15-16 Rear 17"
Dymag Aluminum Wheel UP7X - #UP7X-B3133A ZX10R 16-17 Front 17" x 3.5"
Dymag Aluminum Wheel UP7X - #UP7X-B3136A GSXR1000 ABS 15-18 Rear 17"
Dymag Aluminum Wheel UP7X - #UP7X-B3137A FZ07 W/ABS 15-17 Front 17" x 3.5"
Dymag Aluminum Wheel UP7X - #UP7X-B3138A MT-07 w/ABS 15-19, MT-09 w/ABS 15-19 Rear 17"
Dymag Aluminum Wheel UP7X - #UP7X-B3139A FZ-09 W/ABS 14-17/MT-09 18-19 Front 17" x 3.5"
Dymag Aluminum Wheel UP7X - #UP7X5-B2744A 1050 Tiger 07-10 Rear 17"
Dymag Aluminum Wheel UP7X - #UP7X-B3084A YZF-R6 17-18 Front Wheel 3.50" x 17"
Dymag Aluminum Wheel UP7X - #UP7X-B3283A YZF-R6 17-18 Rear Wheel 17"
Dymag Carbon Wheel CA5 - #CA5-B3084A YZFR6 17-18 Front 17" x 3.5"
Dymag Carbon Wheel CA5 - #CA5-B3283A YZF-R6 17-18 Rear Wheel 17"
Dymag Carbon Wheel CA5 - #CA5-B3093A GSXR1300 ABS Hayabusa 13-18 Front 17"x3.5"
Dymag Carbon Wheel CA5 - #CA5-3129A XV950 15-16 Front 17"x3.5" 17" x 3.5"
Dymag Carbon Wheel CA5 - #CA5-B1224A KZ1000 / KZ1000 mk2 76- 81 , Z1R 78-80 Front 17" x 3.5"
Dymag Carbon Wheel CA5 - #CA5-B1226A KZ1000 / KZ1000 mk2 76-81 , Z1R 78-80 Rear 17"
Dymag Carbon Wheel CA5 - #CA5-B1227A GS1000 78-84, GS1100 80-83 Front 17"x3.5"
Dymag Carbon Wheel CA5 - #CA5-B1228A GS1100 80-83, GS1150 84-86 Rear 17"
Dymag Carbon Wheel CA5 - #CA5-B1231A CB750F 79-83, CB900F 79-83, CBX1000 79-83 Front 17" x 3.5"
Dymag Carbon Wheel CA5 - #CA5-B1233A GSXR1100 88-96 , GSF1200 Bandit 96- 00 Front 17"x3.5"
Dymag Carbon Wheel CA5 - #CA5-B1234A GSXR1100 (15mm Spindle)86-87 Rear 17"
Dymag Carbon Wheel CA5 - #CA5-B1237A CBR900R 95- 97 Front 17" x 3.5"
Dymag Carbon Wheel CA5 - #CA5-B1248A KZ1000 J/R 81- 84 Front 17" x 3.5"
Dymag Carbon Wheel CA5 - #CA5-B1274A GSXR1100 (15mm Spindle)86 Front 17"x3.5"
Dymag Carbon Wheel CA5 - #CA5-B1294A ZRX1100 97-00 , ZRX1200 01-08 Front 17" x 3.5"
Dymag Carbon Wheel CA5 - #CA5-B1339A CB1100F 83 Rear 17"
Dymag Carbon Wheel CA5 - #CA5-B1339B CB750F,CB900F 79-84, CBX1000 78-83 Rear 17"
Dymag Carbon Wheel CA5 - #CA5-B1354B CB1100F 83 Front 17" x 3.5"
Dymag Carbon Wheel CA5 - #CA5-B1365A ZX1000 88-90 Rear 17"
Dymag Carbon Wheel CA5 - #CA5-B1495A V-Max 1200 Front 17" x 3.5"
Dymag Carbon Wheel CA5 - #CA5-B1496A V-Max 1200 Rear 17"
Dymag Carbon Wheel CA5 - #CA5-B1497A FJ1100 84- 85, FJ1200 96-98 Front 17" x 3.5"
Dymag Carbon Wheel CA5 - #CA5-B1524A CBR900R 92- 94 Front 17"x3.5"
Dymag Carbon Wheel CA5 - #CA5-B1609A GSXR1100 93-96 Rear 17"
Dymag Carbon Wheel CA5 - #CA5-B1616B 848 08-13, Monster M1100 E,S and EVO 08-10, Hypermotard 1100s 08 Rear 17"
Dymag Carbon Wheel CA5 - #CA5-B1639A GSXR600 00-05,GSXR750 00-04, TL1000 98-01 Rear 17"
Dymag Carbon Wheel CA5 - #CA5-B1639B GSXR1300 Hayabusa 99 - 07 Rear 17"
Dymag Carbon Wheel CA5 - #CA5-B1640A TL1000R 98- 00 , TL1000S 97-00 , GSXR1300 Hayabusa 99-07 Front 17"x3.5"
Dymag Carbon Wheel CA5 - #CA5-B1667A FJ1100 84- 85, Rear 17"
Dymag Carbon Wheel CA5 - #CA5-B1795A ZRX1100 97-00 Rear 17"
Dymag Carbon Wheel CA5 - #CA5-B1798A ZX1000 88-90 Front 17"x3.5"
Dymag Carbon Wheel CA5 - #CA5-B1835A CBR1100XX Blackbird 97-00 Rear 17"
Dymag Carbon Wheel CA5 - #CA5-B1882A CBR900RR 98- 99 Front 17" x 3.5"
Dymag Carbon Wheel CA5 - #CA5-B1883A YZFR1 98- 03 Front 17" x 3.5"
Dymag Carbon Wheel CA5 - #CA5-B1883B XJR1300 15- Front 17" x 3.5"